Any complex mechanical system that relies on a range of moving parts in order to operate will break down on occasion. Regular maintenance can help prevent a lot of issues, but sooner or later, some part will need to be repaired or replaced. If your automatic garage fails to work properly for whatever reason, our technicians can help you out. Your garage door uses tracks to help keep its movement completely aligned. These components need to be free from dents and rust, otherwise, the rollers, which facilitate the movement of the panels, could slide out or get stuck. 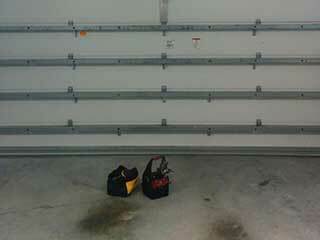 If your garage door got off track, odds are one of these components is responsible. Track repair and roller replacement are two tasks that are best left to the experts, as your door relies heavily on the good condition of these components, and it could collapse if they aren't repaired correctly. Your garage door springs are some of the most important parts of the entire system. Unfortunately, they are also incredibly dangerous and can cause serious injuries when they are mishandled. If their coils become deformed, they could end up breaking, which poses a serious safety concern. Seeing as broken spring replacement is something that should never be handled by an amateur, we urge you to reach out to our team as soon as you find yourself in need of this type of service. The device that powers the operation of your automatic system, i.e. the opener, can suffer from its fair share of issues. Gears can wear out or break, a chain drive can snap or get stuck, and even the electrical parts, like the circuit board and the safety sensors, can experience some problems. Whatever the case may be, you can count on our technicians to expertly handle any opener motor repair or sensor alignment task safely, and see to it that your system quickly returns to its fully functional form. No matter what's wrong with your system, our technicians at Garage Door Repair Pflugerville will be able to provide you with an effective solution. Give us a call today and we'll take care of everything.